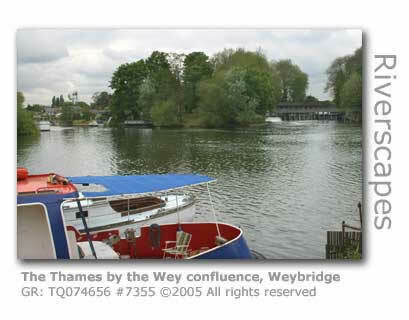 The Thames is significant to the Wey Valley in that both Navigations were dependent upon the Thames for generating much of the river borne cargos that made them financially viable, and of course the Wey has its confluence with the Thames as a major tributary near Weybridge. A great deal has been written about the Thames, and here we pay little justice to the history and industriousness of this magnificent river other than to highlight it in this context. A large flotation boom was tested on the Thames near Weybridge (September 2008) to facilitate training should a major environmental disaster threaten the river. The orange boom is long enough to stretch across the full width of the river and is designed to contain fuel or chemical spills. The boom blockade enables a slick to be guided to the riverbank where it can be removed by a pump. The boom requires four operators and takes around two hours to fully deploy. The Environment Agency has owned the boom for 15 years. The River Thames is an ancient river formed in its current configuration during the last glacial period 25,000 years ago, its name having metamorphosed through various forms including the Anglos-Saxon Tamyse and Latinised Tamesis. The current name was not standardised until the 17th century. The river has its source at Trewsbury Mead in the Cotswolds and flows for over 215 miles (344 km) dropping 356 feet (108 m). The river by the time it has reached Kingston-upon-Thames has an average flow of 1,253 million gallons (5,696 million litres) a day, which by English standards ranks the Thames as England’s major river. The non-tidal stretches of the river are fed by 38 main tributaries covering a 3,841 square mile (9,948 sq km) catchment area, one of these being the River Wey which joins the river at Thames Lock, near Weybridge in Surrey. The whole catchment area covers 5,924 sq miles (15,343 sq km). The Thames becomes tidal below Teddington Weir as it covers the final 68 miles (109 km) of its journey to the sea, joining the English Channel by the location of the now defunct Nore Lightship moored in the estuary between the counties of Essex and Kent. The Thames has a total of 44 locks straddling the non-tidal section of the river, the furthest upstream being St John’s Lock at Lechdale in Gloucestershire which provides the beginning of the navigational drop from 234 ft (72 m) until the tidal stretch is marked by the last lock at Teddington in Middlesex. The locks along the Thames are a lot larger than those along the Wey with the smallest at Buscot Lock in Oxfordshire being 108 ft (33 m ) long and 14.8 ft (4.5 m) wide, and the largest at Teddington Barge Lock being over 650 ft (200 m) long, reflecting the greater volume of waterborne traffic the Thames once had to contend with. Boulter’s Lock is featured in Jerome K. Jerome’s classic novel Three Men in a Boat (1889) following the antics of the three in search of good health and adventure. "Most of my life I have dwelt in the neighbourhood of the river. I thank Old Father Thames for many happy days. We spent our honeymoon, my wife and I, in a little boat. I knew the river well, its deep pools, and hidden ways, its quiet backwaters, its sleepy towns and villages". The Thames Barrier was constructed to counter the continued threat of flooding along the river in London, the city having suffered from destructive flooding for centuries. Many of these floods have resulted from the combined effect of floodwater flowing down the river and peak tides flowing up the Thames estuary meeting and resulting in a surge of water back up the river. The barrier is raised to prevent these extraordinarily high tides reaching the river proper. The futuristic barrier was opened in 1982, its cost of £535 million becoming immediately worthwhile as major flooding in the city has since been prevented. London’s flood defences combine the barrier with over 36 other barriers and gates together with over 115 miles of defensive embankments. A major contribution to flooding is the continual silting up of the river bed, with the year-round dredging operation having to contend with some 300,000 tonnes of sediment deposits per year. The commercial and industrial significance of the Thames has throughout history been highly significant and has been the focus of industry requiring water for power and process, a key source of fish stocks, and of course a major transportation route. Much of the waterborne traffic along the Wey Navigations either started or finished with journeys along the Thames to and from the major docks located in London that handles cargoes from the four corners of the earth. The foundation of the British people’s significant civic freedoms and rights was formed on the banks of the Thames at Runnymede when King John was forced by his Barons to sign the Magna Carta in 1215. Although in reality the document was not what we would today regard as a particularly sound charter as it really covered a series of concessions wrung from an unwilling king, but at its heart was an important principle. From thence the power of the crown could be limited by written grant. It was John's tooing and froing at arms against his foes in Normandy and France that had resulted in the royal treasury needing to desperately replenish its coffers, and this in turn lead to a general revolt against extortionate taxes and even more damaging, some serious assaults by the king's officials against the personal liberties, not just of the general populace but also of the nobility. Once the king had agreed to the concessions the nobles renewed their oaths of allegiance to the king. In reality the document signed at Runnymede was actually an outline of the concessions known as the Articles of the Barons, and the Magna Carta or the Great Charter was the formal royal grant issued after the event. Why were the articles agreed in open meadows alongside the Thames at Runnymede when there were ample castles and baronial halls all around that would perhaps have better suited such an important occasion? The answer was simply that such was the distrust at this time between the nobles and their king, and the country was on the verge of civil war, that the nobles chose a piece of open ground midway between Windsor Castle where the king was residing at the time, and Staines where the barons were encamped. The field also gave enough space to allow both side's military forces to be able to amass to ensure the safety of the signatories. The arcane custom of Swan Upping still survives on the Thames today having had its origins in the 12th century. All swans along the Thames are a legally protected species and are the rightful property of the Crown. This ownership and the custom of swan upping originates at a time when swans were considered to be a ceremonial dish fit for a king and graced the tables of the nobility. Those not of the royal household were allowed to have ownership provided the birds were suitably marked upon a fee having been paid to the Royal Exchequer, and were in the keeping of landowners who paid in excess of 5 marks per annum for their freehold (‘The Lawes, Orders and Customs for Swans’ 1482). In the time of Elizabeth I anyone caught in the possession of a swan without authority could be fined heavily and imprisoned for up to a year. The purpose of Swan Upping was therefore to mark all cygnets with the same mark as those of their parents to establish ownership, the mark being engraved on the young swans’ beaks. The process today is restricted to a small section of the Thames with the Dyers and the Vintners Companies continuing their largely ceremonious right of being allowed private ownership of swans. Another significant Thames tradition is the annual University Boat Race. Young male pride and no doubt palefulls of testosterone were the reason for this historic event ever coming about. Two university students, Merivale from Cambridge and Wordsworth (a nephew of the poet) from Oxford, threw down a challenge that the best university would win a race down the Thames. The first race was held from a starting point at Henley-on-Thames in June 1829 with Wordsworth's team the outright winners. Such was the excitement generated by the race that it rapidly became a national event of such interest that the start point had to be moved twice due to the massive crowds attending. The races were moved from Henley to Westminster, but by 1845 Westminster couldn't cope with the crowds and so the race relocated 6 miles up-stream to Putney from where it starts to this day. Even today crowds of over 250,000 regularly congregate along the course and over 6 million watch on TV. The race has been beset by many sinkings (6) and some controversy, but always the human endeavour and the overiding pride of this traditionally English event has won through. The first live radio commentary was broadcast in 1927 and the first TV coverage in 1938, both by the BBC. The first female Cox steered Oxford to victory in 1981, there was a mutiny in the Oxford team in 1987 when an American oarsman was dropped in favour of the English president of the team, and the heaviest crew member ever was a 17st 5lb Chris Heathcote in 1990. The frost fairs held during the 17th and 18th centuries have sadly long since sunk without trace, no doubt another victim of global warming, as these highly popular and colourful affairs were held on the frozen winter waters of the river itself. The section of the river that the fair goers could always depend upon freezing over was the section imediately downstream of the old London Bridge. The stone bridge was completed in 1176 and its 19 narrow arches so slowed and channelled the river that the water here was the first to freeze. The first frost fair documented was that in 1683 when the river froze over in December and its surface remained as solid ice for two months. Seeing the opportunity of making an extra florin or two local traders soon set up stalls and entertainments to sell to the Londoners who had flocked onto the ice to skate and frollick. Whole oxes were roasted and even King Charles II and his family graced this first of the frost fairs. The fairs could only be set up when the ice was thick enough which didn't happen every year, however whenever it did the event grew rapidly in popularity and in its formal organisation. At its peak the frost fair's attractions would include fairground rides, and sports including football, hockey, skittles and horseracing. Musicians, singers and storytellers also intermingled with the crowds. Ever resourceful the watermen who were unable to work the river took to breaking the ice near the banks and charged visitors to be helped across. The traders charged whatever they could get away with for their wares and a popular contemporary rhyme highlighted the fact that: "what you can buy for threepence on the shore, will cost your fourpence on the Thames or more." The last frost fair was that held in 1813-14 and once the old London Bridge was replaced with the 1831 structure that had wider arches the chances of any more fairs were lost forever.